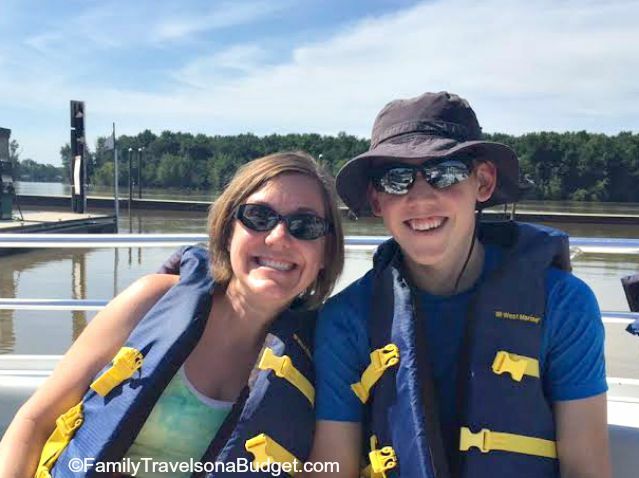 Home » Uncategorized » Parasailing: In Illinois? Perhaps you’ve been to Florida, Gulf Shores (that’s Alabama) or Mexico and watched vacationers sail high above the beach. 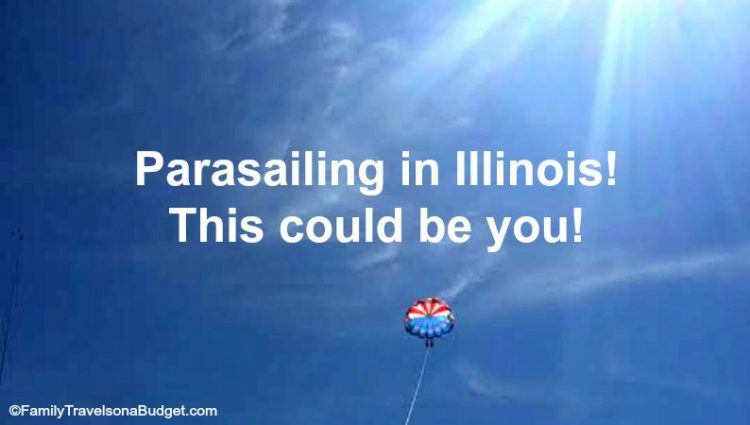 BUT, parasailing in Illinois? Parasailing only works where boats can sail (really, they’re speed boats… but let’s stick to the term sailing) INTO the wind. Most inland waters don’t offer the space or wind direction to make it possible. 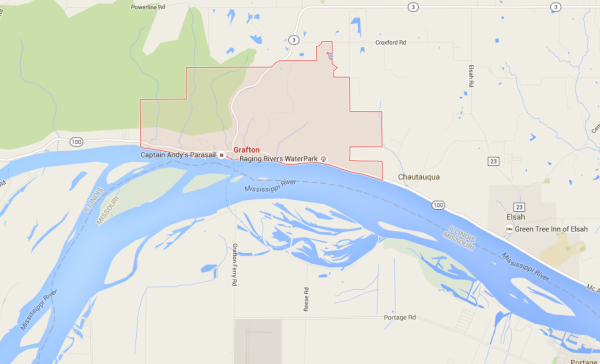 In Grafton, Illinois, where the Mississippi and Illinois Rivers meet, Captain Andy found the ONE PLACE where wind and water make it possible to parasail. Yes, IN Illinois! Captain Andy is a U.S. Coast Guard licensed master captain. His boat, “First Class,” is also Coast Guard documented and inspected. The vessel was built specifically for deck parasailing, and Captain Andy puts safety first. You can soar with the eagles — actually far above them — with confidence! Captain Andy sails out of the Grafton Harbor Marina, 215 West Water Street, Grafton, IL. The marina has plentiful, free parking. Head past the Marina facility (store on first floor, Big Kahuna restaurant upstairs) to the Parasailing hut on the dock. There you’ll register, sign the required release and get a safety briefing. From there, Captain Andy will take you to the boat and help you settle in. He and the crew will explain how the parasailing equipment works and ask your weight. Don’t worry! He won’t tweet your secrets. He does need your weight to know how to adjust the equipment for a safe parasailing experience. “First Class” can carry 12 passengers, so you might go out with other groups. 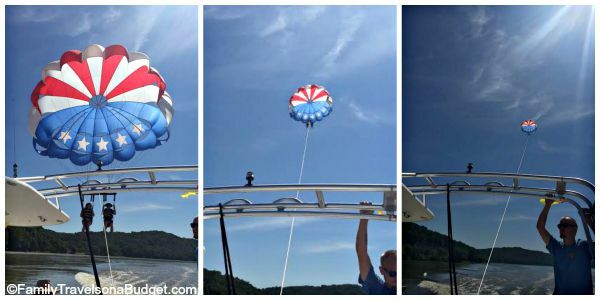 When it’s your turn to parasail, you will be guided to the launch deck at the back of the boat. The crew will repeat the safety instructions and harness you in. Once you’re set, they’ll release you to sail. Up, up and away. Okay, not away! You will soar 500 feet above the shore! Captain Andy’s Parasail from CoryB on Vimeo. Ben and I hardly noticed as we climbed — everything was so peaceful and smooth. As the world below got smaller our grins grew. We floated high above the treetops and the birds. The view is breathtaking! We sailed while the Mississippi was flooded, so we saw a community baseball field under water, just the lights and backstop visible above the muddy water. Interestingly, as we soared, the knot that held the parasail rope to the boat was situated directly in front of me. If I looked at that knot, I got a little panicky. My mind couldn’t really grasp that such a small rope and knot could tether us so well. As Captain Andy says, though, “If you know how to tie a knot, you only need one!” He’s right. That knot held us just fine. The crew reeled that rope in like a fisherman with a rod. To schedule your parasailing adventure with Captain Andy, click here. Weather permitting, he sails from May to October 31st. He welcomes riders aged 4 to 104. If you suffer from anxiety, are afraid of heights or have difficulty following safety instructions, you shouldn’t sail. Captain Andy said he’s had a few young kids who didn’t understand the safety instructions and one who was very scared that he felt shouldn’t parasail. Safety always comes first. Ben and I agree that parasailing is relaxing, not strenuous. The only muscles you’ll strain are the cheek muscles — from that big grin that won’t leave your face. Yes, I said, “My cheeks hurt” more than once! Do you have any questions about parasailing? Did I tempt you to give it a try? Let me know! Comment below or join the discussion on Facebook! Thanks, Captain Andy, for treating Ben an me to a great adventure. Our Great Illinois Roadtrip was smooth sailing, and you kicked it off right! It was a pleasure to take you and Ben parasailing. We’re glad you had a good time. Friends, family and fans were a bit jealous. When people ask about our trip highlights, parasailing was definitely up there! People never guess we sailed the river.